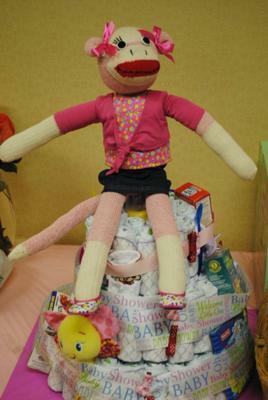 Alesha went all out on this cute diaper cake and her cake topper is so creative! We love new and fresh ideas and Alesha's Sock Monkey Diaper Cake is full of unique ideas to inspire all who are looking for some inspiration! We are so grateful for readers like Alesha who share their ideas and photos. 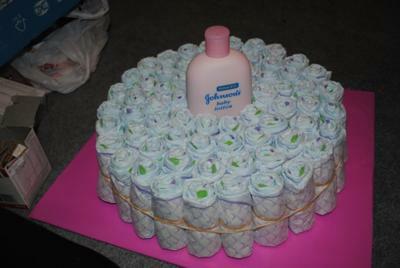 When someone shares a diaper cake on our diaper cake photo gallery, they not only share it for a few days with a few people, but they share it for years, with thousands of our readers, because every diaper cake in our gallery will be forever listed among our list of creative diaper cakes. 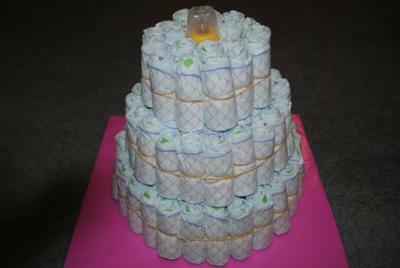 So we thank Alesha for paying it forward with her cute diaper cake! 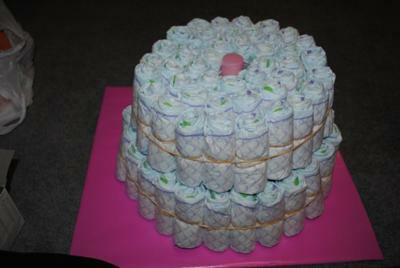 If you have a diaper cake to add to our gallery, just click here to submit it! I made this cake for my sister's Baby Shower (Amy). It was a big hit. I also made the pink sock monkey to sit on top. Thanks for the great instructions.